Ilana and Aaron met for the first time during the summer of 2005. Ilana was a marketing intern for SYAS and staffing their first Shabbos Nachamu weekend, and Aaron was a participant. The two hit it off quickly, and even though Ilana was leaving soon to spend her (college) senior year studying in Israel, Aaron asked her out on a date. They decided to go out just one time, not expecting much and leaving things open-ended for the future. They had great date. It lasted 5 hours and included a trip on the Circle-line, a stop at Ben & Jerry’s, and a long discussion on a random park bench. Ilana left for Israel two weeks later. She and Aaron kept in touch via email for a few weeks and by Succos time had lost touch. Fast forward three years now to 2008. Ilana and Aaron were each in the Shidduch process and despite running into one another at Central Park the summer of ’07, never thought to try dating again. Mostly because of their 9 year age gap which was discovered after agreeing to their initial date. This time around Ilana signed up for the same Shabbos Nachamu weekend as a participant. Aaron had just stopped seeing someone else and had no interest in attending. However, when Marc Goldman asked him last minute to accompany his friend Lavi Greenspan on the Shabbaton, Aaron agreed. Lavi has lost his eyesight several years earlier and would be participating and speaking about his inspirational personal story during the weekend. Aaron planned on helping Lavi but did not plan to meet anyone. That weekend Ilana though she spotted Aaron Friday night, but the two first ran into each other Shabbos afternoon. Ilana’s opening line …. “Are you crashing?” She had checked the participant list on Friday, scanned the names for guys she had dated, and did not recall seeing Aaron’s name which alphabetically would have been one of the first. Aaron explained that he was on the Shabbaton just to assist Lavi and was not officially participating. Soon after Aaron thought of a friend to set-up with Ilana and thought they should catch-up to determine if the suggestion was still appropriate. As the two had an extensive conversation about the last three years since seeing one another Aaron realized that he was interested in dating Ilana himself. The two had each grown spiritually and now had even more in common. Lavi, knowing that Aaron had been talking to Ilana for several hours in the afternoon, intuitively decided to take matters into his own hands at Seuda Shlishit. When Aaron stepped away from the table, Lavi asked Ilana if she would consider dating Aaron again. She said she wasn’t sure and gave no definitive answer. When Aaron returned to the table Lavi brought up the subject and put the two on the spot to schedule a date. Partially out of interest, and partially out of respect for Lavi, Ilana and Aaron scheduled a second first date. Their relationship progressed quickly. Ilana and Aaron dated continuously and spoke on the phone every night, even when Aaron went on vacation to Israel. Both had a “good feeling” early on but waited three ½ months to get engaged. Matt was 34 when he met Asya, 25. He was from Staten Island; she from Boston. The couple was married in March 2008 and reside in Brookline, Massachusetts. What was your impression on the phone? M: It was a really engaging conversation. It was scintillating. Sometimes you talk to people and there’s just not a lot to talk about and that didn’t seem to be the case. A: We went to a lousy Chinese Restaurant. Did you know right away that this was your match? Or did the relationship grow to the point that you realized this was the right person? Sometimes we think you know exactly what you want but when you find the right person you realize that this person is actually different than what you thought you wanted. How does your spouse compare to the image of the person that you thought you’d marry? A: He was exactly what I wanted. M: Its interesting, we tend to think about our bashert in really specific details about what we are looking for. I would say that Asya ticks a lot of the right boxes. But if you had asked me a year ago what does your bashert look like and who is she and all those things that make someone not just a set of specifications but actually human, I don’t think that I would ever have come up with the picture of Asya. How long did you date before becoming engaged? A: Moshe took me to the beach that we went to early on in dating and it was a magical day. M: Of course the beach in the winter is totally deserted and I can say it was an amazing moment. M: I used other sites and friends, and I would try to meet people at shul and other places. I even met someone on an airplane who I was serious with for awhile. How long would you say that you were seriously looking for someone? What were the biggest challenges that you feel that you went through while dating? M: My travel schedule was pretty hectic. I spend almost half the month overseas. We’d go on a great date and then I’d be gone to Australia. It sorta breaks the momentum of things but it also forced us to be more thoughtful about things. What did you find most helpful about the matchmaker? M: It takes the meat market almost out of the equation. I think it’s really easy for people to become really jaded from looking through profiles. How involved with your relationship was the matchmaker who set you two up? A: I really appreciated her technique. I worked with other matchmakers on the site, and Shifra was the one who would email me and ask me how things were going. Did the matchmaker keep to your preferences or did he/she encourage you to meet people who fell outside your initial dating guidelines? What advice would you give to others about this? A: I was too open minded at first, but I would tell people to try to meet as many people as possible. Did you have any hesitation about using an online dating site? About using a matchmaker? What convinced you to try it? What surprised you the most about the site and the matchmakers? A: by the time I got to SYAS I had been on other sites. My younger sister was on SYAS and she convinced me to try it. What would you say to encourage others to try online dating, specifically SawYouAtSinai? M: Someone recently made a comment to me that ‘gee its such an unromantic way of meeting someone’ and my response was that it was just the opposite and I think people should realize this. Leaving things to chance is possible, but for me what’s more romantic is making your own fate. I know I can always tell my kids that. Q: What was your impression on the phone? Female: He first called to tell me that someone else had come up in the interim between him saying yes to me and me saying yes to him. I immediately thought he sounded so sweet and intelligent - I wished him good luck and secretly hoped to hear from him in the future if his current date didn't work out. Thankfully, he called me a few weeks later. Q: What did you do on your first date? Female: We went to a cafe and had a great conversation. It wasn't a long date but it was a good one. Q: Did you know right away that this was your match? or did the relationship grow to the point that you realized this was the right person? Female: We realized pretty early on - we only had a handful of dates before we started talking seriously...Sometimes we think you know exactly what you want but when you find the right person you realize that this person is actually different than what you thought you wanted. Q: How long did you date before becoming engaged? Female: We got engaged 7 weeks after meeting each other - on our 10th date! Q: What did you find most helpful about the matchmaker? Female: She was so easy going and friendly - she was ready to be as involved or uninvolved as we wanted her to be and was extremely helpful to both of us in terms of questions we had. Q: What would you say to encourage others to try online dating, specifically SYAS? Female: Honestly, I just think it can't hurt. Everyone has their shaliach and SYAS and my shadchan were mine and the shaliach for so many others, so why not try it. I found that the ratio of "in-the-ballpark" guys to "not-for-me" guys that I was set up with was the same whether it was through friends/family or through the site. I also found that many guys who I knew were sought after and considered good catches were on the site, and I know the same is true about the girls. We live in a busy world and everyone is on the fast track of life. Trying to find that special someone can be quite challenging. I had the opportunity to interview two people who found love, and can you guess where they found it? Online through SawYouAtSinai.com! Q: What made you go on line to look for your spouse? Arielle: I was serious about wanting to find someone and I wanted to use all avenues that were available. Elliot: I knew the matchmaker and she encouraged me to join. Q: What other things did you do to meet people? Elliot: I went on many blind dates. This was the only web site that I joined. Q: Did you date a lot of people before meeting each other? Elliot: I was looking for nine years and must have dated over 120 women. Q: What were the biggest challenges that you faced while dating? Elliot: Figuring out what to do on a date. Arielle: It was not that memorable. Elliot: I remember that she showed an interest in me on the phone and I liked that. Arielle: We went to a café. Arielle: After the fist date I did not want to go out with him again. However, my matchmaker persuaded me to see him again. After the second date I knew if I gave him a chance I would marry him. I knew after the third date that I wanted to marry him. Elliot: For me the process was longer, it took me a few months to know that she was the right one. Q: Sometimes we think you know exactly what you want but when you find the right person you realize that this person is actually different than what you thought you wanted. How does your spouse compare to the image of the person that you thought you’d marry? Arielle: Elliot was everything I thought I didn’t want but as it turns out he was everything I really wanted. My motto is toss out the list! I now realize that I would have been miserable if I married the guy who met all the criteria on my list. Elliot: Arielle did not match my list of what I thought I wanted in a person. Arielle: We went to a nice restaurant then he took me to a park. He gave me a beautiful bracelet and asked me to marry him. Arielle: Tova was our matchmaker. I found her easy to talk to, she listened and she gave me personalized attention. Tova ignored my list. She understood my personality. She encouraged me to go out with matches that were right for me, even though at the time I thought she was wrong. She also gave me a lot of good advice. Elliot: Tova didn’t just make a match for the sake of making a match, she spent time trying to figure out what was the right match. Her help and guidance was instrumental in getting us to go out, connecting and getting married. Q: What advice would you give to those who are still looking for their beshert? Arielle: Don’t reject those that don’t have the things that you are looking for. You may not really want them. By using a list you may be eliminating your beshert. Q: What would you say to encourage others to try online dating, specifically SawYouAtSinai? Arielle: I found it hard to get to know people at a party or in social situations. It just seemed to take longer to get beyond the small talk. With a matchmaker you cut right to the chase. I do think that dating online is romantic. Elliot: Having a matchmaker helped us in the process of dating. Without her sound objective advice we would not be here today. We’re happy to report that Arielle and Elliot have been married since 2004. They are proud parents of boy named Abraham. Jennifer was at a Jewish single friend’s for Shabbos and right before Shabbos Jennifer’s phone rang but Jennifer did not answer, thinking it was too close to Shabbos. After Shabbos Jennifer picked up the message and it was from Channie Brum, one of the matchmakers on SawYouAtSinai saying that she just met Randy. The next day on Sunday, Jennifer had a chance to look at Randy’s Jewish dating profile and she saw many things that were appropriate and on target for her. The second shidduch date was the very next day, and on that date Randy said something to Jennifer that made her think to herself “This one might really be a keeper.” At the end of the second date, Randy put Jennifer in a taxi, gave the driver money and asked the driver to take Jennifer home. Jennifer says that in over 10 years of dating, and plenty of guys, Randy is only the 3rd guy who had ever done that! As Randy was about to close the door to the taxi, he asked Jennifer if her could call her again, and she to him straight out, “yes.” Jennifer was amazed with herself because normally she tells the man to call the shadchan, but in this case, she told him directly to call her. Even though she had never been that straight with a guy and her behavior was outside her normal range, she did not feel scared or nervous. Instead, she felt comfortable and she knew that this feeling was special and that it said something about their relationship. Randy returned to LA that Tuesday and for the first week or so, the two spoke a few times. Then, Randy and Jennifer began speaking every night for 2-3 hours a night! When Randy came back to New York after one month to see Jennifer again, the two saw each other twice and just talked for hours and hours while walking around the city, sitting in Central Park or eating dinner. At this point, Jennifer knew she really wanted to hold onto him. While Jennifer and Randy were apart in different cities, it was difficult for both of them, and they spoke to each other and text messaged each other constantly. Jennifer made one trip to LA and after that Randy came to NY every second week to see Jennifer. Three and a half months after their first date, Randy proposed to Jennifer in New York. The happy couple were married in February 2006. Jennifer had been on the Jewish matchmaking and Jewish Dating site SawYouAtSinai since its inception in 2003 and she says there have been hits and misses with various men until she met Randy. If it was not for the Jewish matchmaking site and for shadchan Channie, Jennifer does not see how it would have been possible for she and Randy to have met each other. Mazel Tov to the happy couple! When Dena Kimmerling was a busy student, she really did not have the time to actively and successfully pursue Jewish dating shidduchim. 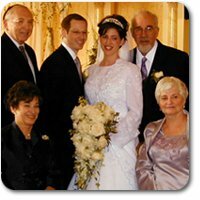 A friend suggested that Dena join Jewish matchmaking service SawYouAtSinai, and Dena readily agreed, thinking that it was the best way to put herself out there, while maintaining a busy schedule. Soon after Dena joined the Jewish dating site, she was sent the profile of Jack Volk. In reading his profile, she thought he sounded quite appropriate for her so she accepted. He was only the first or second guy that she had ever gone out with from the Jewish matchmaking site SawYouAtSinai and she was looking forward to meeting him. The first date arrived, and Jack came to pick Dena up at her parents’ house. She invited him in to meet her parents, as she does on all of her first dates. Right away, Jack and Dena started joking around with each other—there was an instant click between them. Dena’s parents had an immediate good impression of Jack, and they told Dena that he seemed to be a quality person with a good “look,” or “chein” about him that they liked! What really clinched the shidduch for Dena was when, at the end of the date, Jack got straight to the point and directly asked Dena if he could call her again for a second date. She was very impressed with his being direct, and his not playing games with her. It was clear that Jack wanted to date in a focused and serious way and Dena wanted the same as well. Of course, she told Jack that he could call her! The second date arrived and the two Jewish singles went bowling. The entire shidduch date was comfortable, easy-going, fun, and not at all awkward. After the second shidduch, Dena says she stopped counting dates, and the couple started seeing each other very often. A month into the dating, Dena and Jack discussed with each other that they saw themselves being together for a very long time. Seven months later, on Chol Hamoed Sukkot, Dena and Jack decided to go to Build A Bear Workshop, a place where you can custom design and dress a teddy bear. The two were stuffing and dressing their bears when Jack made his way over to the personalization section of the workshop where he could design a specialized dog tag to put on his bear. Dena remembers that Jack was there for quite a long time and when he was finally done, he came over and tried to put the tag on the bear. He had difficulty with the tag, however, and Dena offered to help but Jack told her that she could not look at the tag until it was on the bear. When Dena finally read the tag she saw that it said, “Dena, will you marry me? Love, Jack.” By the time Dena processed what she had just read, she realized that Jack was on one knee with the ring out! She was shocked! “I had no clue that he was going to propose to me that day,” she said. When Ilana Lew came back to New York from school in Boston, she had lost most of her connections and networks in the frum dating world. One day, someone mentioned to her that she should sign up for SawYouAtSinai, but Ilana scoffed at the idea, thinking she would never do that. “I was skeptical about online Jewish dating,” she said. “I did not want everyone out there to know I was dating online—it did not seem tzanua to me.” But a few weeks later, Ilana changed her mind. She was serious about shidduchim and she decided to sign up for Jewish matchmaking and Jewish dating site SawYouAtSinai because it offered her the network of shadchanim and shidduchim that she needed, as well as the privacy and classiness that was important to her. Ilana had only been on the site for one month, and had only gone out with one other shidduch from the site, when she was sent the profile of Danny Masri. At first, the profile did not seem an exact match to what she was looking for so she sent his profile to her best friend for a second opinion. Her friend told Ilana that she felt that Danny was definitely not a match. So, the first date arrived, and guess what? “It was amazing,” says Ilana. She knew right away that this was a good thing and that something positive was going to come of it. On the date, Ilana and Danny went out to dinner for wraps but they were unsure of what blessing to make on the wrap. Was it Hamotzei or Mezonot? So Danny pulled out his cell phone and called three Rabbis on the spot and got an answer to what blessing was appropriate for that exact brand of wrap. Ilana was so impressed with Danny’s special connections with his Rabbis and his ability to reach them promptly and get an answer to such a question. After the date, Ilana emailed that same friend who had previously said that Danny was not a match for Ilana with the title “I Like Him!! !” The friend was surprised, but of course very happy! “I recently moved back from Israel and had never dated in America. So I inquired from several friends how the Jewish dating and shidduch process worked in America. I was swiftly referred to SawYouAtSinai’s Jewish matchmaking website and for a minimal fee I signed up and became a member. Soon after signing up Channie Brum, one of the shadchanim (Jewish matchmakers) I had chosen, sent me a profile of a young lady, and I responded that I would be interested in dating her. Little did I know she would soon be my wife. Now the way SYAS works is first the man responds and then the man’s profile is sent to the woman and she has ten day to respond either yes or no. After the ten day period the profile goes into some sort of default and it is as if she responded no. So I sent my response in and waited, day 1, day 2, 3…..10 no reply. So that day I called up shadchan Channie and said “nu! What's going on, her profile seemed so appropriate.” Channie, responded without delay and called Aliza on the phone and asked her why she didn’t reply. Aliza said that she was no longer an active Jewish single on SYAS and never got my profile, but that she was interested in hearing about me. So, shadchan Channie read her my profile... Now I usually point to my wife at this point when people ask how we met… As she describes it “my eyes welled up with tears and I looked over at my best friend and said I was just read my husband”. This page contains only simchas through the Jewish Matchmaking and Jewish Dating site SawYouAtSinai and is not currently affiliated with the Onlysimchas site. 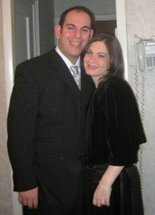 Please go to www.onlysimchas.com to see their Jewish singles simchas. If you know of any other simchas as a result of Jewish dating from SawYouAtSinai that are not included on our engagements page, please email us at support@sawyouatsinai.com. SawYouAtSinai merges Jewish matchmaking with online Jewish dating. Jewish singles use a Jewish matchmaker, a shadchan, to send them a shidduch so they can find their bashert. The Shadchanim have made shidduchim for Jewish singles all over the world including: New York, Miami, Chicago, Los Angeles, Boston, Washington DC, London, Manchester, Jerusalem, Johannesburg, Sydney and Melbourne to name a few Jewish singles locations.